After undercover Israeli soldiers infiltrated into the Gaza Strip, on Sunday at night, and assassinated two senior leaders of the Al-Qassam Brigades, the armed wing of Hamas, the army initiated a series of air strikes, the army fired missiles and shells to secure the retreat of its undercover soldiers, killing five other Palestinians. Hamas fighters exchanged fire with the soldiers killing one of them, Israeli sources have confirmed. Updated: The undercover soldiers were driving a Volkswagen car, and drove towards the home of Noureddin Baraka, in Bani Suheila area in Khan Younis, before stopping near the property, the al-Quds News Agency has confirmed. Fighters of the Al-Qassam Brigades then noticed the car and stopped it near a kindergarten in Abasan al-Kabeera town, and asked the passengers to step out of the vehicle and show their ID cards. It added that the undercover soldiers, who were in the backseat of the car, then opened fire at the fighters, after realizing their cover-up has been exposed. Al-Quds also stated that some of the undercover soldiers were wearing veils, pretending to be women. The senior fighter, Noureddin Baraka, was instantly killed in the initial shooting, while other fighters called for help, before chasing the car that carried the undercover forces. The Israeli army, stationed across the perimeter fence, started firing shells at cars and Palestinians who chased the undercover officers’ vehicle, before it crashed against a wall, and then headed toward the perimeter fence. So far, the Israeli soldiers who was killed in the Gaza invasion, has only been identified as (Lt. Col. M.). The army is still keeping other information classified, but his family has officially been notified. The Al-Qassam Brigades said the undercover soldiers who infiltrated into an area, east of the southern Gaza Strip city of Khan Younis, assassinated one of its senior leaders, identified as Noureddin Mohammad Salama Baraka, 37. It said that the undercover soldiers used a civilian car to drive three kilometers into the area of Abu Shanab Mosque, east of Khan Younis, and assassinated Baraka. Al-Qassam stated that the Israeli Air Force then started firing missiles, killing five Palestinians, and wounding at least seven.armed wing of Hamas. The army also fired several shells into lands, east of Khuza’a town, east of Khan Younis, in addition to firing many flares. It is worth mentioning that al-Qarra just got married a few days ago. Both Baraka and al-Qarra are senior leaders of the al-Qassam Brigades. Following this serious Israeli military escalation, the Israeli army asked the Israeli colonialist settlers living close to the border with Gaza to remain indoors, and closed the Zikim road. Furthermore, the army issued a statement confirming that no soldiers were abducted during the offensive into Gaza, and declared high alter along the border area. In addition, the Al-Quds Brigades, the armed wing of the Islamic Jihad, issued a statement declaring readiness for any possible escalation. So far, the name of the Israeli officer who was killed in the invasion into Khan Younis remains unpublished by Israel. The army only confirmed his death, and that another soldier was injured, underwent a surgery and is currently in “moderate and stable condition,” at Intensive Care Unit, in Soroka Hospital. 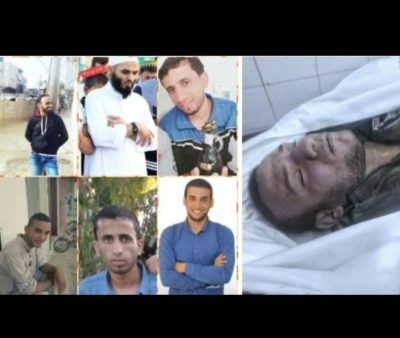 Israeli forces attacked a group of Palestinians in the southern part of the Gaza Strip, east of Khan Younis, firing at them from a passing car after infiltrating Gaza dressed as civilians, killing six. Following the shooting attack, Palestinians in the area reported multiple airstrikes, as well as heavy artillery fire from Israeli tanks stationed at the Gaza-Israel border. Israeli sources reported that Israeli soldiers invaded the Gaza Strip as part of the ‘operation’ to kill the six fighters, one of whom was allegedly a senior commander with the armed wing of the Hamas party. The military issued a statement meant to quell rumors inside Israel, saying that ‘no Israeli soldiers were abducted during the operation’. Israeli sources reported that one of the six men killed in the airstrike was Nur Barake, a deputy commander of an elite unit of Ezz al-Din al-Qassam, the military wing of the Hamas party. According to local sources, the Israeli strikes and artillery fire began around 9:30 pm on Sunday, around the same time as the drive-by shooting attack. The Israeli military claimed that ten ‘projectiles’ were fired from Gaza following the killing of the six men and the continued airstrikes. The Palestinian ‘projectiles’ fell into the desert, causing no damage. The spokesperson for the Hamas party, Fawzi Barhoum, issued a statement condemning what he called “cowardly Israeli aggression”. The Gaza invasion and killing comes a day after Israeli Prime Minister Binyamin Netanyahu was embarrassed by Israeli media reports that he was somehow being too soft on Palestinians in Gaza by allowing foreign aid to provide a part of the salaries that had been denied to Palestinian employees in Gaza for months. The attack by Israeli forces is a direct and blatant violation of the ceasefire negotiated and agreed to by Palestinian and Israeli officials earlier this week.